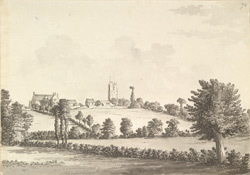 A view of Newton (Newton St Loe) from the Lower Bristol Road in Somerset, three-and-a-half miles west of Bath. The parish church dedicated to Holy Trinity can be seen at the top of the slope and includes a Gothic Perpendicular west tower. Near the church there are other buildings - a free school dating from 1698 and a house dating from 1715, both of which are still standing.